HAUGEN, Gilbert Nelson, a Representative from Iowa; born near Orfordville, Rock County, Wis., April 21, 1859; attended the rural schools; moved to Decorah, Winneshiek County, Iowa, in 1873 and engaged in agricultural pursuits; attended Breckenridge College, Decorah, Iowa, and Academic and Commercial College, Janesville, Wis.; engaged in various enterprises, principally real estate and banking; moved to Northwood, Iowa, in 1886 and engaged in banking; treasurer of Worth County, Iowa, 1887-1893; in 1890 organized the Northwood Banking Co. and became its president; member of the State house of representatives 1894-1898; elected as a Republican to the Fifty-sixth and to the sixteen succeeding Congresses (March 4, 1899-March 3, 1933); chairman, Committee on Expenditures in the Department of the Interior (Sixtieth Congress), Committee on Agriculture (Sixty-sixth through Seventy-first Congresses); co-sponsor of the McNary-Haugen farm bill in 1927; unsuccessful candidate for reelection in 1932 to the Seventy-third Congress; died at Northwood, Iowa, July 18, 1933; interment in Sunset Rest Cemetery, Northwood, Iowa. Harstad, Peter T., and Bonnie Lindemann. 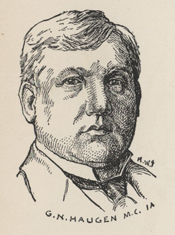 Gilbert N. Haugen: Norwegian-American Farm Politician. Iowa City: State Historical Society of Iowa, 1992; Michael, Bonnie. Gilbert N. Haugen. Apprentice Congressman. Palimpsest 59 (July/August 1978): 118-29.